With her trilogy of plays set in different eras in Detroit, Dominique Morisseau is making her mark on Connecticut. First up is Paradise Blue, playing at the Long Wharf Theatre through December 16. At Hartford Stage early in 2019 will be Detroit ’67, followed by Skeleton Crew at Westport Country Playhouse in June. 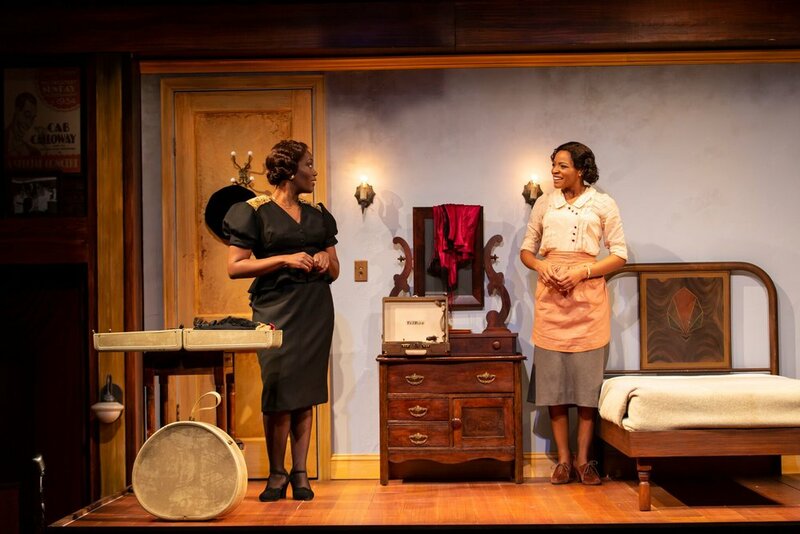 Comparisons to August Wilson, who wrote ten plays, each set in a different decade of the twentieth century, mostly in Pittsburgh (some of which debuted at the Yale Repertory Theatre), are perhaps unavoidable. Like Wilson, Morisseau sets the plays in one town at different eras and writes with a feel for how the people who live there talk, peppering their colloquial tones with references to poets and musicians and significant contextual events—here, the fact that Paradise Valley, a famed strip of businesses and jazz joints owned by African Americans, is perilously close to being razed in favor of “urban renewal,” that catch-all phrase for driving out those unwanted by the city’s vested interests. The play’s dialogue has a robust feel for the people of a unique period, even if the plot invites comparisons to many a noirish B-movie. We have Blue (Stephen Tyrone Williams), the inheritor of a jazz club his old man originated, making a go of it with his house band, while his paramour and factotum Pumpkin (Margaret Odette) keeps everything shipshape in the kitchen and in the rooming-house upstairs. As the play starts, the combo’s drummer, P-Sam (Freddie Fulton) is learning to his dismay that their bass player has quit over altercations with Blue. Genial elder piano-player Corn (Leon Addison Brown) tries to strike a conciliatory note. The back and forth of all this establishes that Blue, whatever his actual talents, views himself as the best trumpeter and best leader of a combo in the best club with the best accommodations in the Black Bottom area of Detroit. He can be more than a bit overbearing. Meanwhile, P-Sam seems sweet on poetry-reciting Pumpkin and would be plying her with “I’ll take you away from all this” blandishments, if only she weren’t so dedicated to Blue. Into this volatile situation strides Silver (Carolyn Michelle Smith), with a walk that has “femme fatale” written all over it. She’s from Louisiana and she’s got money and attitude and a history with jazz clubs. What’s more, she makes no secret of the fact that her Ex met an early demise. Her status as a woman of mystery seems like the main plot point—the men call her a “spider,” and we wonder who’s going to get caught in her web. Meanwhile, Blue, coming to terms with his declining powers as a performer, may be ready to sell the joint to those developers nosing around—and Silver might be interested. For Morisseau, with the hindsight of what became of Paradise Valley, Blue can be seen as a selfish culprit, engaged in a form of race or at least community betrayal. The possibilities of what will develop keeps us in the play, though there’s no role here that sets the measure of the drama. In this production, directed by Awoye Timpo (previously an Associate Director on Wilson’s Jitney on Broadway), each character functions as part of the plot, but without giving us much sense of inner illumination. The big reveal before the Act One curtain is that Silver’s got a gun. What Morisseau delivers—which tended to elude Wilson—is a heart-to-heart between the female characters. If the males here are mostly perfunctory—with Addison Brown fairing best in making his every scene shine—the two women have a chance in Act Two to get some things out on the bedspread. In Silver’s tidy little room, complete with record-player and Lester Young LPs she brought along, the two come to terms with spousal abuse, which Silver suffered in the past and Pumpkin is suffering from now. The scene plays out as an awakening for Pumpkin, a view of how things could be changed with Blue, but we might still wonder about Silver’s motives. That she’s there to undermine Blue is clear from the start; she also romances Corn—their post-coital scene in bed plays well as a frank chat between a woman who doesn’t want to get caught and an aging gent looking for a lover who will stick. And yet, when things get violent—as they must—Silver is off to the side, an onlooker at a situation she helped inspire. Without going too far into the dynamics of how that happens, and how docile Pumpkin, a woman who seems genuinely to enjoy serving men (this is 1949, after all), and whose idea of cussing is to say “Fudge!” and “Grits!,” ends up brandishing a weapon, let’s just say that Morisseau determines that the most dramatic outcome will be the least probable. And who can argue with that? It’s troubling that a few key scenes in this production don’t manage to land with the level of feeling Morisseau may intend. Key to where the play goes is a scene early on between Blue and Pumpkin. Whatever the level of abuse she later admits reluctantly to Silver, in this scene Pumpkin seems fully attached to Blue, despite his “demons.” Those demons take the form of both abuse of others and a devastating memory that gets trotted out like a required traumatic backstory. Williams’ Blue never quite delivers fire, despair or threat, seeming to be a blusterer who likes female sympathy and the sound of his own voice. If there’s anything deeper in this “genius” (so-called by Corn and Pumpkin) it has to make its presence felt. As Corn, Leon Addison Brown is likeable, with a folksiness that helps us feel the set-in-its-ways tones of the locale. He also delivers the show’s best speech about how being a black man in a white world is a constant check to the ambitions of a big talent like Blue. Freddie Fulton’s P-Sam is volatile, comical, belligerent when drunk, sweet when he tries to be, and he gives a good account of a proud and underappreciated heart. As Pumpkin, Margaret Odette is never quite as mousy as maybe she should be, having a definite point of view. She seems our contemporary, despite her penchant for poetry with antiquated locutions like “nay.” As Silver, or trouble in a tight-skirt, Carolyn Michelle Smith makes some grand exits and entrances, and wears well the sleepwear she’s assigned, but what she’s meant to manifest—other than temptation for the men and a view with no illusions to Pumpkin—never quite arrives. Some of the fault with this production’s lukewarm temperature comes from the staging. Yu-Hsuan Chen’s set, a club in its off-hours, looks suitable and creates a public yet intimate space for what amount to haphazard encounters. The bedroom slides in over the bar—a production element a bit too slickly distracting—and is an odd box of a space for some major scenes to play out in. For music, we have prerecorded bits that give us the lone, lorn horn of Blue, occasional jazzy background, and accompaniment for a little song-poem from Pumpkin. For a play situated in a beloved and storied center of jazz and blues, it all looks and sounds a bit antiseptic. Given our druthers we might well decamp for another club along the strip well before the show’s over.